Happy Bloggers Challenge Friday! I'm glad you stopped by today, I've got some great things to share with you for this weeks challenge. As you could tell by my title, it's all about Christmas for this weeks challenge - so if you're still looking for Holiday ideas, you've come to the right place. If you've been to my blog in the last two weeks, you know my latest obsession is with Glimmer Mist and the Bow Easy - I'm addicted I tell you! Continuing with my obsession, I created today's ornament for the challenge. 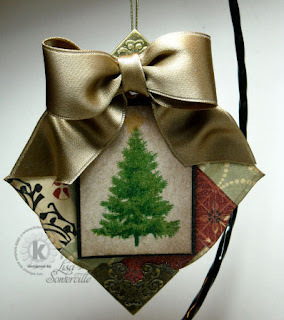 I used Cosmo Cricket Papers and the Herringbone Technique from the current TJNL, I covered my Chipboard then used Spellbinders Labels Three to cut my shape. 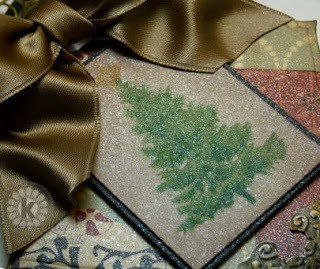 The beautiful Pine Tree image is from the Multi Step Pines from Kitchen Sink Stamps, stamped in shades of Green on a piece of Kraft card stock, then sponge the edges in shades of Brown. Where's the color recipe you ask? I'd love to share it, but I've had this stamped image on my desk for two weeks now, just waiting for the right project, and never wrote down my colors - sorry! To give a little more vintage look to my ornament, I added some metal corners from the Idea-ology Line to the top and bottom points of the label, securing them by pounding them into place with a hammer. I used the beautiful Sable Ribbon and the Bow Easy to create the bow, secured in place, then lightly misted my whole project with Pearl Glimmer Mist. For even more inspiration, click on the Bloggers Challenge Logo on my side bar to see the wonderful creations the Challenge Players created this week. Oh my goodness, this ornament is gorgeous. I love it. Oh..Lisa, this is gorgeous....WOw. I am loving it. This is a stunner! I think I might have to invest ina Bow Easy if the bows are guaranteed to be this fabulous! Your ornament is absolutely drop dead gorgeous! WOW! Gorgeous! Love the rich feel of this! Hi, Lisa! (I popped in to get your email address.) Gorgeous ornament and bow!!! Wow! This is a beautiful ornament. Your bow is stunning! Beautiful Ornament and Stunning Bow (I need a Bow Easy). This is so pretty...Love the combination of papers and that image is just wonderful! Lisa, I love the ornaments you've been doing! Great job! Do you have them displayed somewhere special? Lisa, this is gorgeous--such a great vintage feel! Gorgeous! The satin bow is spectacular.